Massive road rehabilitation projects worth P181,767,000 million pesos are being implemented by the DPWH, Surigao del Norte 1st Engineering District, Surigao City, under the stewardship of OIC –District Engineer Linda A. Uypala. 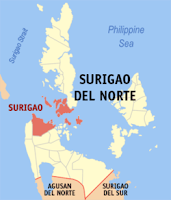 The project implementation is along the stretch of the national highway of Surigao Wharf Road, Surigao City, – San Juan Coastal Road, Surigao Agusan Road section, Surigao-Davao Coastal Road and Quezon-Mapawa-Capalayan-Espina Navarro Road. These projects are under the CY 2011 Regular Infrastructure Program of this district. It involves rehabilitation of 8.425 km. damaged paved road and asphalt overlay of 5.827 km, with exception sections due to good road condition construction of cross drainage (1-barrel R.C. Box Culvert) and concrete pavement of 0.91 km. gravel to paved road.